Linking up with Kelly once again! This week,we’re looking into the future. Kind of. My boys are still quite young, but I think every parent starts considering their schooling options pretty early, especially if you live in a not-stellar school district and don’t easily have room in the budget for parochial or private schools. So here we are: seven reasons I’m currently considering homeschooling (once we reach the school years). By homeschooling, we can build in movement throughout the day and take breaks whenever needed. Many teachers express concerns about parents homeschooling when those parents have had no training in pedagogical methods, classroom management, etc. But the thing is, you don’t NEED classroom management skills when you’re instructing one-on-one. What you need are parenting skills to connect with your own specific child. And who’s better at that than mom? Plus, in all honesty, I’m pretty smart. I’m confident in my ability to understand and transmit knowledge to my kids. I like writing (obviously–wouldn’t be blogging otherwise! ), I’m good at math (started working as an actuary after college) (quit it) (but that’s another story), and I like to read about lots of varied subjects. I feel personally up to the job. I’m also really concerned about the fact that kids in school who learn at a slower pace than their classmates (which happens! Kids develop on their own timelines!) effectively learn that they are “dumb” by getting poor grades over and over at school. And once they label themselves as dumb, all sorts of other problems pop up, like a belief that they can’t learn, or don’t like learning At home, the comparison game can be avoided. Each kid can learn at his own pace in each subject, and hopefully enjoy it all more. The problem with Catholic school: the private schools are expensive (like, the nearby classical Catholic grade school is over $8 grand a year! ), and the diocesan grade schools vary wildly in quality. The one nearby us is… okay? But I’m not thrilled about the prospect of paying even 3 or 4 thousand dollars a year for an “okay” school. The problem with public school: sure, it’s free, but our school district is also only okay, and public schools also come with other issues. Specifically, the relativism, materialism, bullying, and gender-confusion so pervasive in our society. I do not want my boys in the bathroom with females. I might be tempted to overlook some of these things if we lived in a truly great school district (and combat them at home through discussion during the out-of-school hours), but we don’t. So why bother with them in the first place? Homeschooling also provides a good opportunity to build in catechesis. The religious education curricula in most schools and CCD programs aren’t in great shape, either. I could go on and on about this topic, but suffice it to say: schools and CCD classes have too many felt banners and not enough of the actual Catechism. It’s such a shame. 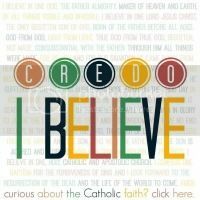 Our faith is full of beautiful ideas and solid reasoning, but most Catholics have never been exposed to so much of it. And then there’s the key, comforting aspect of homeschooling that makes it all possible: the knowledge that trying homeschooling for a year doesn’t lock us in forever. If all goes well, great! If not, well, to school we will go. Nothing ventured, nothing gained… but it’s good to know there is an escape hatch available if necessary. And that’s a wrap. Have a beautiful November weekend, lovely readers! Regarding #2 – EXACTLY! You’re qualified to teach your kids because you are their MOTHER! I am a former high school teacher and I get so frustrated when people tell me that its ok for me to homeschool because I was trained as a teacher. Let me tell you – teaching 160 15 year old is TOTALLY DIFFERENT than teaching my own two children. But I’m qualified to do it, not because I am a former teacher, but because I am their mother. Having taught in grade school, I would add that expectations of behaviour in the early grades seems more geared towards girls’ development. Now I teach at college, I see the fruit of that in diminishing numbers of young men in my classes. BTW, I just read Home Grown by Ben Hewitt – a memoir of his radical unschooling of his two boys on their Vermont homestead. I found it challenging and inspiring, even if I wouldn’t follow his model. I have essentially all of the same reasons you do. My oldest is a 3 year old boy, and while he is unusually verbal, holy cow does that kid have energy!